Apartment City (45 m2, 1 floor) »»» The City apartment is located on the 1st floor of a traditional town house in the Old Town, in the foot of the Wawel Castle, between the Main Market Square and the fashionable Jewish quarter - Kazimierz. The flat consists of one room with entresol, a kitchen annex , bathroom with shower and toilet. There are two single beds in the room and comfortable marital bed on the entresol . 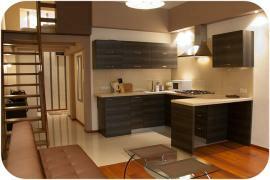 The City Apartment is very elegant, spacious and fully equipped. The car can be parked in front of the building or on the guarded car park in Miodowa street. There is a TV SAT and free of charge internet access.